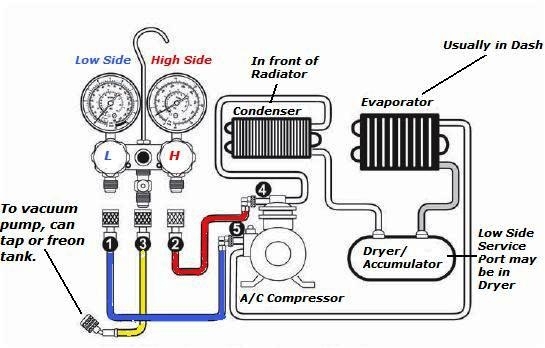 © DenLorsTools.com Summary: One of our most common questions about air conditioning has to do with “how to charge a car’s ac.” In this auto repair blog, we cover the do’s and dont’s of DIY car AC refrigerant charging. We have suggestions on how to fill a car’s air conditioning system if doing it yourself. We caution DIY’s of the dangers and the possibility of over-charging a car’s air conditioner. Questions and answers covering AC gauge sets, charging kits, troubleshooting, refrigerant, leaks and much more. Basic step by step directions are provided. Low refrigerant is the most common cause of a car’s air conditioner not cooling well. 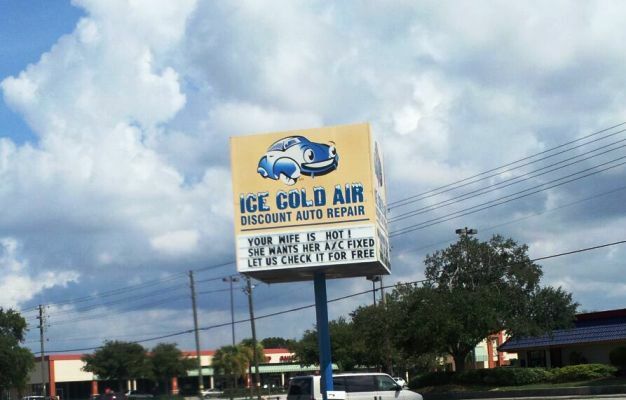 There are many other reasons a car’s A/C may be blowing out warm air though. We strongly recommend the use of an AC manifold gauge set when checking a system. Realistically, we understand that many people are only looking for a quick fix and will purchase a do it yourself-er charging hose or a charging kit to add Freon. The purpose of this article is to help those that are going to use a recharge kit to add refrigerant and take their chances. Keep in mind that if a car has a very slow leak, just adding a can every summer may be feasible; but if there’s a fast leak, adding freon is like throwing money out the window. 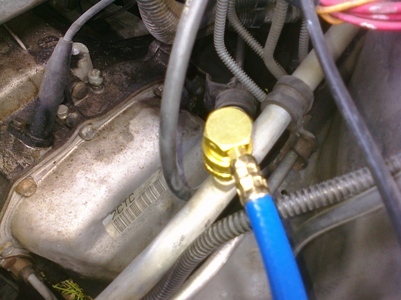 Be sure to click on our related “how to” car repair articles at the bottom of this page for information on using an AC manifold gauge set and detecting refrigerant leaks. 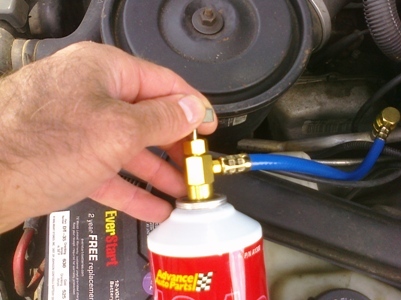 Step by step directions for simply adding freon to an R134 A system. 1. Locate the low side service port. Do not connect to charge hose at this time. The quick connect fittings are different sizes on the low and high sides, this makes hooking into the high side impossible with a do it-yourself charging kit. The service port cap will be black or sometimes blue. It is in the larger diameter line (suction side) or depending on the system, the accumulator. 2. 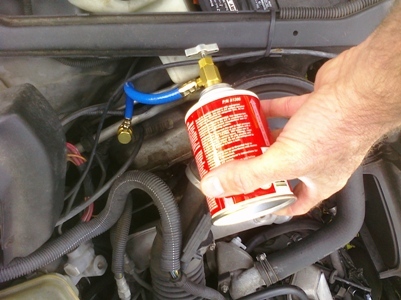 Read warnings and handling information on the refrigerant can. Safety glasses are recommended to protect your eyes. Avoid skin contact with refrigerant. Make sure the piercing needle is retracted and then connect the screw fitting to the top of the can. 3. Start the engine in the car and turn on air conditioning. Set controls to maximum cooling. Connect the charging kit to the low side service port located in step one. The quick connect spring coupler will need to be pulled back while the fitting is pushed onto the port. After it is in place push the sleeve to go back into the down position. Make sure it is in the locked position and is fully engaged. 4. Turn the valve’s knob to the right which will pierce the can. Turn the knob back to the left which will allow the flow of refrigerant (134A) into the car’s AC system. The can should be held upright and shaken. The reason for not holding the can upside down is that vapor will rise to the top of the can. Liquid will be in the bottom. If liquid is allowed to go in to the car’s A-C system and enters the compressor, as a liquid, the A/C compressor may be damaged. The compressor CANNOT compress liquid. Rotating the can quickly between the 12:00 position and 3:00 position while shaking, will help to vaporize the refrigerant while charging. 5. You may feel the can getting cold while charging – this is normal. 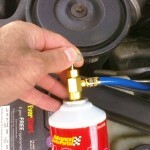 Get a feel for the refrigerant in the can so it can be determined if there is any remaining in the can while charging. 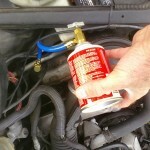 Once it feels empty, the can will be turned upside down to insure the last bit has been drawn into the car’s AC system. 6. If the car is blowing cold air now, the job is almost complete. Avoid adding too much, I’ve said it before in my other articles “more isn’t always better.” (That’s why it’s better to use an AC manifold gauge set when charging.) Close the valve by turning it to the right. Disconnect the quick connect fitting and replace the cap onto the service port. Question – How do I know if my car has 134A? Answer – Cars manufactured from 1996 and up will most likely have 134A. The 134A type quick connect fittings are a good indicator. Older cars that have not been retrofitted (that still have R12) will have smaller fittings which are threaded, NOT quick connect type fittings. Question – How do I know how much freon to add to top off my system? Answer – You don’t. The only way to know 100% is to use an AC recovery machine to remove all the refrigerant. Vacuum the system down using a vacuum pump and then use a weight scale to put the factory specified amount back in. Mechanics with experience can use gauge sets to help them make an educated guess on how much to add. Our article linked at the bottom covers more when it comes to gauge readings and what they mean. Question – How do I jump my low pressure switch to make my compressor come on so I can charge the system? Answer – There’s no need to jump the low pressure switch. The compressor will come on when enough pressure is in the system for it to run without it being damaged. Question – I’ve just replaced my compressor. How do I vacuum the system down first before I charge the system? Answer – If evacuating and recharging the system, you need an AC manifold gauge set and a vacuum pump, below are basic steps. Measure oil removed when the system has been emptied. The only legal way to empty a system is with an AC recovery unit. Replace the refrigerant oil that was previously measured. Note that some replacement compressors come with oil in them others do not. Lack of oil may ultimately cause compressor failure, just like running a car motor without engine oil will cause seizing. (old oil is not to be reused). Turn the replacement compressor’s shaft 10-15 times by hand to displace refrigerant oil (this will help prevent damage to the compressor). Vacuum the system down with an AC vacuum pump. The AC manifold gauges should both be OPEN while doing this. The longer the better, but 15-20 minutes ok.
28-29 inches of vacuum should remain, if there’s no major leaks. Close both valves, remove vacuum pump. Connect to refrigerant source. 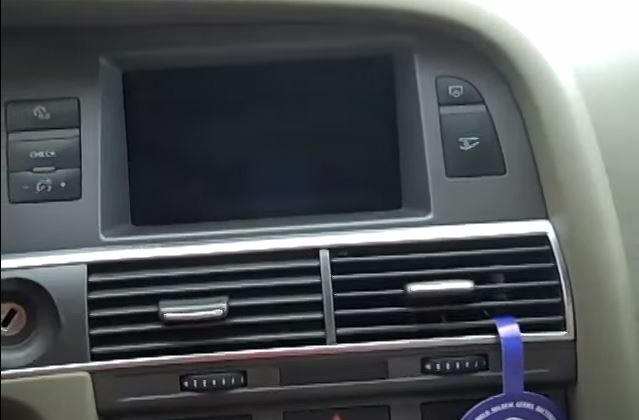 Start engine and turn AC on. Start charging the system by opening the BLUE valve which is the low side. Warning: opening the red valve (attempting to charge through the high side) can possibly cause the refrigerant can to rupture! Use cans so you know how much refrigerant you are putting in or a scale that weighs the bulk container. Question – I charged my system but it didn’t stay cold for very long. What could be the problem? Answer – Most likely there’s a leak that is too fast to make occasionally charging feasible. Use a refrigerant leak detector to determine where the leak is and replace the leaking component. 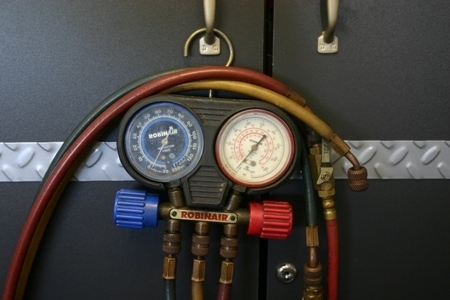 See our article linked below about how to find refrigerant leaks. Question – Since you sell them, parts stores and even Walmart sells charging kits; why don’t you recommend them? Answer – Using a simple charging kit with NO gauge is like walking in the dark. You may find your way around, but you may stub your toe! Adding freon to a system without a gauge set makes it much more difficult to end up with a proper amount of charge since there’s blind guesswork involved. Question – I know I have a coolant leak in my AC system. Should I use the freon kit that has stop leak in it? Answer – Not a good idea. The stop leak may slow the leak down. It may also damage the compressor, clog up the condenser, evaporator or expansion valve. If you end up taking the car to a repair shop and they find that there’s stop leak in the system – they most likely will refuse to work on it. Stop leak wreaks havoc to expensive recovery units. In fact we sell a filter to help prevent damage to AC recovery machines because it is such a problem. Just to clarify; the refrigerant in the AC system is NOT called “coolant.” Coolant or anti-freeze is in the radiator/car engine’s cooling system NOT the air conditioning system. Question – I need change a part in my AC, how do I get the freon out? Answer – Take it to a shop and have them recover the refrigerant. Then take the car home and change the failed part. It’s the only way to remove the refrigerant without having an expensive RRR (Recovery, Recycle & Recharge) machine. A recent customer mistakenly thought that a vacuum pump was designed for recovering/emptying a system – this is NOT the case. Please reference this auto repair article when quoting, linking to this page is welcomed and appreciated. If you are new to linking a page. 1. Left click the link; to highlight 2. Right click, select copy 3. Right click and paste to forum, blog web page etc. Thanks! Disclaimer: Auto repair information/tips are designed for informational purposes only, without warranty of any kind, in no event shall the author of this site be liable for any consequential, incidental or direct damages sustained in the course of using the information in this article. © DenLorsTools.com all rights reserved, DMCA filing actions will be carried out against scraper sites that steal our content. Dave, It’s possible that it’s under or overcharged. Can’t diagnose without the high and low readings. The high pressure switch will turn the clutch coil off if the high side gets too high to protect the compressor from damage from excess pressure. The low side pressure switch will shut the coil power off also, because running the pump (compressor) with too little refrigerant can also cause damage. 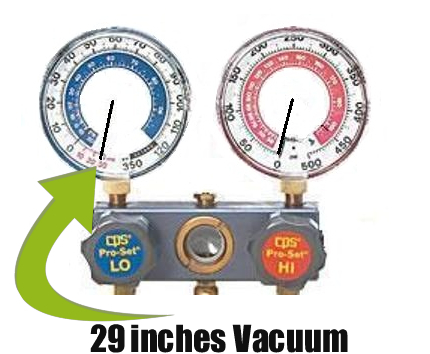 See our AC Gauge Readings Explained repair article for more insight. Cheers, Dennis. My nephew’s Honda accord is not blowing AC, so I tried adding a can of stop leak r134 after about 15min it does not appear it is taking the refrigerant. I would never add stop leak, because it can cause other problems. Also, low refrigerant isn’t always the problem. I would try to add Freon unless I thought the gauge readings indicated it was low. I’d check the gauge readings and go from there. Good Luck. The vehicle sat for 6 yrs but it was working when last used. It’s an R12 system and the AC compressor turning but it wont take charge from my R12 can. Please help. Red, after sitting for 6 years the seals are likely to be dried up and will probably leak. Especially the front seal on the compressor. This doesn’t explain why the refrigerant won’t go in to begin with though. A little should go in without the compressor running. After some starts to go in, the front hub of the clutch should start to engage and disengage. This is called cycling. Since you are getting NO FREON to go out of the can at all, I’d say you are doing something incorrectly. If you are using a simple can tap, perhaps you’re not opening the piercing valve before trying to charge the system. Once you get refrigerant to go into the system, check for leaks, especially the front of the compressor. Good Luck. 98 f150 how much on average to repair ac hose that has a leak at a a/c repair shop? I recharged my 2011 honda civic’s air conditioner and now the compressor keeps shutting off and on every few seconds and the air is hot in the car, could it be over chared and if so is there a way to release some of the freon to fix the situation? Katrina, letting Freon out into the atmosphere is illegal and harmful to the Ozone. I would check the gauge readings and go from there. It could be over charged or under-charged. No one knows without the pressure readings. Good Luck. Robert. I would check the cooling fan. Also see one of my other articles on the AC only blowing cold at highway speeds. Good Luck. Dennis can you please help me? I’m lost. Bought a used 2002 Chevy Cavalier and the ac wasn’t working. Thought perhaps the compressor was bad so I checked it but it operates as it should. Discovered that my ac hose had a hole and leaked out the freon. I replaced the hose and recharged the system. I don’t believe I have any further leaks because the system holds pressure and no more freon loss but the ac still won’t get cold. Any ideas on what my problem is? Thanks in advance! Karl, I’d check the gauge readings and diagnose that way. Good Luck. I’m working on 01 PT Cruiser and have an a/c problem. We charged the system, but the compressor kicking on but not cold in inside. The high pressure is cold and low side reads nothing. Can you help please? Thanks. Karim. the low and high side pressure readings would tell us what’s going on. From what you’ve said there could be a very fast leak and the system is holding no Freon. I’d check both readings and go from there. If both readings are zero, I’d check for a leak. Good Luck. I have a 1997 Honda Accord. Last year the a/c started to periodically quit cooling. I changed a schrader valve and charged the system with guages. Yesterday it quit cooling. The compressor never cycled off. Both lines were warm. The high side was only 125 and low side was reading a vacuum.. I added 12oz of 134 and the high side was almost 200 and low went further in vacuum….-15. Still hot air. Is my a/c compressor bad? Jerry, most likely a bad expansion valve. Good Luck. As a follow up from more reading on your website….could it be as simple as a bad expansion valve? Thks! ok, I just saw your reply. Thanks for the follow up. Is that a half day task on a 97 accord? Varies, but you would need to have the Freon recovered first. Good Luck. I have a 2007 Honda Accord. I have charged it a couple of times and during a the day 82degrees, it’s never blows cool air but later in the evening it would it gets cold. Lately it’s just worse in the sense that, the driver side is just blowing warm air while it blows a little cooler at the passenger’s. Cabin filter is new, compressor seem to be okay when checked according to the tech, AC fans are okay except that the condenser has never been checked. Please advise because I have recharged the system exactly 3 times in 9 months. By mistake (what else), days later, the van was driven for an hour or so with the system a/c turned on. The compressor’s coil were burned up (smoke was visibly). At removing the compressor, dirt came up from it and it won’t freely turn by hand. What are the odds of system being contaminated if there was no freon on the system? I mean, after reapairing the hose and only replacing the compressor, do I will only throw my money if a complete flush is not applied ? Having the AC turned on doesn’t mean the compressor was on. The lower pressure switch will protect and prevent the compressor from running with a system that has low refrigerant or in your case no refrigerant. The compressor most likely was already locked up due to lack of oil in the system. Anytime a compressor locks up it is likely to have put contaminates in the system. Flushing should be done only if you are sure you can get of the solvent out before proceeding. Any left in the system can cause problems. An in line filter is the safer way to go in my opinion. Good Luck. As a follow up to my 97 Accord issue. I replaced the expansion valve, drier and new orings at all connections. I vacuumed the system for 45 min and monitored the -25″ vac for another 45 min with no leak detected. 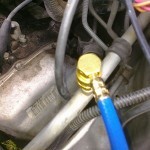 Added approx 0.75 Oz PAG146 oil in my gauge set supply line, and required refrigerant. With an a/c temp Gauge I have had consistent 40 to 41 degree air at the vent for 2 weeks. Thanks again for your help. I have a 1998 plymouth voyager, it started leaking water inside on the drivers side floor so I took apart to see if I could tell where the leak is coming from. then I read that the hose could be clogged under the hood on the firewall behind the alternater. That ended up being the problem, I unclogged it and the water poured out. so I put the inside back together and a few days later it started blowing warm air. What could b the problem? Too late now, but I don’t recommend these DIY kits that add Freon without knowing what’s wrong with the system. Adding Freon is not always the answer. Maybe overcharged now? Maybe a huge leak? Maybe the compressor doesn’t pump properly? I’d check gauge readings on low and high side and go from there. You’ll need an AC Manifold Gauge Set. After you get the readings see our AC Gauge Readings Explained. Good Luck. 2007 mercury montego. The compressor was intermittently running. It is blowing cold when running. Thought it may use a bump. Added most of a can. The compressor is still kicking on and off. I’m thinking it’s the expansion valve but what are the odds it’s the compressor? When compressor is running the pressure drops to where i would expect for a low charge. When compressor shuts off it immediately jumps to 70 to 80 psi. May still be low. See our AC Gauge Readings Explained article which helps in understanding low and high side readings to figure out what’s going on with an AC system. Without knowing both readings I wouldn’t be able to guess very well. Good Luck. Hello. Great website by the way. Very informative and straight to the point. I am driving a 98′ Mitsubishi Diamante LS. Whenever I would turn the ac on a ticking noise started to happen but shortly after a few seconds it would turn off. But now the ticking comes whenever I turn my car on, even with the ac off, and it doesn’t go away. Any idea what this is? Possibly a worn compressor. Would need to be checked. Good Luck. I’d check pressure readings to help diagnose. Good Luck.